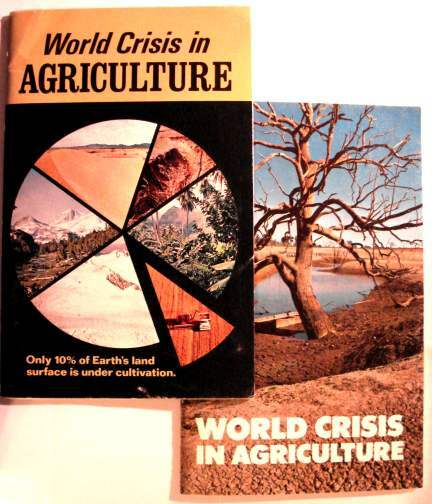 Food and Agriculture...A Growing World Crisis! This series contains articles from various sources including: the U.S. Dept. of Agriculture, the former Ambassador Agricultural Research Department, Agrotech Research Group, Serf Publishing, etc. Few who are alive today remember the "great depression" and "dust bowl" of the 1930's or the food rationing of World War II in the 40's. American's, Briton's and other citizens of the highly develped countries have enjoyed an almost unprecedented abundance of the earth's blessings for over half a century. How long can it continue? World population has only recently grown to six billion (6,000,000,000) hungry humans and is still growing! This writer was born in the midst of the "Great Depression" and attended the international "Limits to Growth" conferences in the early 70's when the world's population was about 3.5 billion and doubling approximately every 37 years. How long can this earth take care of it's mushrooming population? According to Dr. Norman Borlaugh, a Noble Peace laurate called the father of the "green revolution," the world will have to increase food production 50 percent in 30 years, just to feed the world at today's substandard level and double it to provide everyone with the quality and abundance of food enjoyed in America. But, he says, "That (doubling) will never happen. That will be impossible" (Washington State University Hilltopics, June 1995). The world scientist noted that world population stood at 1.6 billion people when he was born in 1914. In 1995 it stood at 5.7 billion. Borlaugh says, "We are adding 100 million (100,000,000) people each year, a billion per decade." "That is the population monster" he said to WSU students in 1995. "That's the problem you young people are going to be wrestling with throughout your careers." Borlaugh warned that U.S. citizens cannot isolate themselves from the world and maintain their standard of living while people elsewhere are malnurished. We will not be immune to the social chaos caused by hunger and poverty, he said. "For those of us on the food production front, let us all remember that world peace will not--and cannot--be built on empty stomachs." "Without food in the stomach, there is instability and chaos." Our world's growing population is in a life and death struggle for land, resources and food. Everyone needs food. This must be produced and marketed to reach your table, a process which has long been taken for granted in the United States and other wealthy nations. But for centuries the world's food-producing resources were carelessly "mined," then abandoned in search of greener pastures. Now, experts warn, these resources are running dry. Today's agricultural situation is plainly one of squandered resources. Even America, often called the "land of plenty" and "breadbasket of the world," is now a major food importer besieged with soil erosion, unpredictable weather patterns, inflated prices and farm bankruptcies in a world of food shortages and international tensions competing for resources. The "Green Revolution" of Norman Borlaugh's day only served to delay the growing crisis. "nation shall rise against nation, and kingdom against kingdom: and there shall be famines, and pestilences, and earthquakes in various places. All these are the beginning of sorrows... But as the days of Noah were, so shall also the coming of the Son of man be. For as in the days that were before the flood they were eating and drinking, marrying and giving in marriage, until the day that Noah entered into the ark, and knew not until the flood came, and took them all away; so shall also the coming of the Son of man be" (vs: 3-8,37-39). What happened in the days of Noah that Jesus Christ was refering to? Biblical history reveals that the world's population began to mushroom exponentially the same as it is today. "And it came to pass, when men began to multiply on the face of the earth..." (Gen 6:1). The population in Noah's day could easily have exceeded six billion people even at much less than today's rate of population growth. The result was a great upsurge in competition for land, resources and food resulting in evil, violence and pollution. "And God saw that the wickedness of man was great in the earth, and that every imagination of his heart was only evil continually... The earth also was corrupt before God, and the earth was filled with violence... for all flesh had corrupted His way upon the earth" (Genesis 6:1,5,11-13). The political, governmental and educational crisis behind many of these problems and how they will be solved. Articles on sustainable agricultural systems. Food vs. Population...Land of Plenty? "Conquest of the Land through 7,000 Years"